Our third guest night of 2016 will be this Monday, featuring the great Stanley Accrington! "Stanley emerged from the dark days of the late 1970's and has been terrorising the cultural world ever since. He has written hundreds of songs in a range of styles on a vast rake of subjects. There are old-style songs on current happenings and modern style songs on ancient events. There are poems, pastiches, parodies, and possibly anything. Apart from the silly and very silly material, Stanley has always been writing serious songs to confuse the situation further. 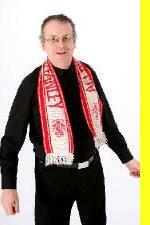 Stanley has been performing all over UK and occasionally beyond at a wide variety of locations and events. The pigeon-hole to put this stuff in is 'miscellaneous-ish'."